This text was addressed to Duke Charles-Eugene of Württemberg on February 6, 1744, on the occasion of his turning 16 and the end of his regency as a minor, to advise him on how to be a good monarch. 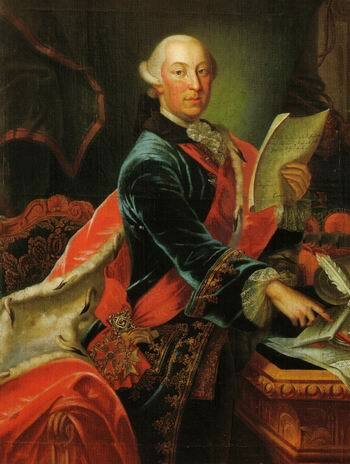 Charles-Eugene was Frederick the Great’s nephew-in-law and had been raised in part at his court in Prussia. Sir, the part which I had in your coming of age interests me all the more in the happiness of your regency, that I imagine in whatever way the good and bad of which will equally redound upon me. It is in this sense that I believe myself required to tell you with friendship and frankness my feelings concerning the new state you are about to enter. I am not of those people for whom presumption and vanity means that instead of advice they only know how to give orders; who believe their feelings to be infallible, and who do not want friends who think, but who behave and breathe only by them. Just as this presumption would be ridiculous, on one side, so I would be guilty, on the other, if I neglected to tell you what none of your servants and subjects will have the boldness to tell you, nor even would want to tell you, in view of their personal interest. It is certain that everyone has open eyes concerning the first début of a man who is taking office, and that the first actions usually determine the public’s judgment. If you first establish your reputation, you will earn the public’s confidence, which is in my opinion that which is most desirable for a sovereign. You will find everywhere people who will flatter you, and who will be mindful only to win your confidence, to abuse of your favor and to govern you yourself. You will also find another kind of person, and mainly among the administrative advisers, who will want to carefully deprive you of knowledge of your affairs, in order to govern them at their convenience; and who make the easiest things difficult for you, to disgust you from work; and you will find in all of them the scheme made to maintain you under tutelage, and this under splendid appearances and the way most flattering to you. Against this you ask: what should be done? You need to become familiar with all financial affairs, to choose some secretary who has worked on them as a subordinate or an assistant, to promise him good rewards for acquainting you with everything relevant to you. Finances are the sinews of a country; if you know them well, you will always be master of the rest. There is an error which I have seen in many of the courts of Germany: that ministers of the princes had the title of ministers of the Emperor, which was their impunity. You yourself sense the harm there would be for you if you suffered this. I must, in addition, warn you that you will find two advisers in the administration, that you would do good to keep: one is called Bilfinger, and the other Hardenberg. It is up to you, sir, to examine them, and to see how much you may rely on them. Be firm in your resolutions; weigh, before taking them, the pros and cons; but when you will have done so much to explain your wills, do not change them for anything in the world, without which each will make light of your authority, and you will be looked upon as a man who cannot be counted on. After an administrative regency, there can be no lack of intrigues at your court. Punish severely those who will be the authors of the first, and each will refrain from following their example. Misplaced kindness is a weakness, just as a superfluous severity is a great crime. One must avoid these two excesses, although only excessive clemency is the flaw of a very noble heart. Do not think that the land of Württemberg has been made for you; but believe that it is you whom Providence brought to the world to make this people happy. Always prefer their well-being to your enjoyment, and if, at your tender age, you know how to sacrifice your desires for the good of your subjects, you will not only be their delight, but you will even know the world’s admiration. You are the leader of the country’s civil religion, which consists of honesty and all the moral virtues. It is your duty to ensure they are practiced, and principally humanity, which is the cardinal virtue of any thinking being. Leave spiritual religion to the Supreme Being. We are all blind concerning this matter, lost in different errors. Who is the bold one among us who would pass judgment on the right path? Be wary then of fanaticism in religion, which produces persecutions. If miserable mortals can please the Supreme Being, it is by the good deeds they spread among men, and not the violence they exert upon stubborn minds. Even though the true religion, which is humanity, would not commit you to this conduct, your policy must do so, for all your subjects are Protestants. Tolerance will make you worshiped; persecution will make you horrifying. The situation of your country, which pertains to France and to the states of the house of Austria, requires you to have a measured and equal policy between these two powerful neighbors. Never show any predilection for either one or the other; that they may never accuse use of partiality; for, in their various circumstances, they will not fail to make you repent alternatively for what they believe to be rightly reproaching you. Never distance yourself from the Empire and its leader. There is security for you against your neighbor’s ambition and power only in the maintenance of the imperial system. Always be the enemy of whoever would wish to disrupt it, for this indeed is nothing but wishing to overturn you at the same time. Do not despise the head of the Empire in his hardship, and be as attached to him as you can be without enveloping yourself in his misfortune. Take advantage of your youth without abusing it. Let a few years pass for pleasure. Then think to get married. The first flame of youth does not make for happy nuptials, and constancy thinks itself of a decrepit old age when it has provided a three-year career. If you take a princess of a great house, she will believe herself to be doing you a favor by being your wife. This would be a ruinous expense for you, and you would have no other advantage than to be the slave of your father-in-law. If you choose a wife of a character more or less equal to yours, you will live more happily, because you will be more at ease, and because jealousy, which great princes always give rise to in their half, will not be your burden. Respect in your mother the author of your days. The more consideration you have for her, the more commendable you will be. Always be in the wrong whenever you should have some quarrel together. Recognition towards one’s parents has no limits; one is censured for doing too little, but never for doing too much. I do not enter into greater detail on matters unimportant, and which are therefore arbitrary. The tender attachment which I have for you means that I will always sincerely take part in your happiness, that I will learn the applauds and blessings which your subjects will give you, with a matchless joy; and that opportunities to be useful to you will be seized by me with an extreme promptness. In a word, there is no joy, my dear duke, which I do not wish you, as there are none of which you are not worthy. Source: Johann Preuss (ed. ), Œuvres de Frédéric le Grand (Berlin: Royal Printer, 1848), vol. 9, “Miroir des Princes ou Instruction du Roi pour le jeune Duc Charles-Eugène de Würtemberg,” pp. 1-8. 1. The elected head of the Holy Roman Empire of the German Nation, a weak confederation, also known as the First Reich. In the modern era, the Archdukes of Austria typically sat on the imperial throne. 2. George Bernard Bilfinger and Karl August von Hardenberg were in charge of the regency while Charles-Eugene was a minor. Bilfinger was a famous mathematician and philosopher, whose writings Frederick would praise in De la Littérature allemande. Hardenberg would later be a leading Prussian reformer, organizing the renewal of that state following the catastrophic defeat of Jena in 1806 at the hands of Napoleon. 4. Note: by “humanity,” the classical philosophers Frederick was familiar with did not mean “all featherless bipeds.” Reason is what distinguishes humans from animals, but only a tiny minority of humans fully emancipate themselves from animal nature, by overcoming ignorance and emotions through the supremacy of reason. Diogenes and Boethius explicitly state that most people are in this sense “subhuman,” while Plato is emphatic in asserting that most people do not have the in-born ability or the opportunity to be genuine thinkers. If by “humanity” one means something like “the highest in us,” that is reason, then Frederick is not necessarily saying something terribly impious, for what is highest in us is necessarily closest to the divine. Fifteen centuries apart, I find remarkable parallels between Stoic and Enlightenment concepts of divinity as Nature, the law of the universe, which we must revere and be in harmony with. 5. Charles VII of the House of Wittelsbach, controlling Bavaria and briefly Bohemia, was remarkable for being the only Holy Roman Emperor in three centuries to not be a member of the House of Habsburg. Frederick’s support for this non-Habsburg Emperor probably reflects his desire to weaken Austria and to maintain a weak imperial system, in which Prussia would maintain her independence. The “misfortune” referred to is probably Charles’ poor health; he would die the following year.